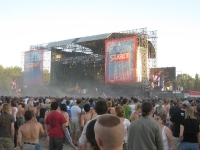 The green island of Obuda, in the Danube River just north of Budapest, is the venue each summer for what has become one of the largest open-air rock and pop gatherings in Europe. Thousands gather on the island for a week-long music extravaganza with more than 1,000 performances across 60 venues. Famous names that have performed at Sziget recently include The Killers, Placebo, Paolo Nutini, Snoop Dogg, The Subways, Korn, Sum 41, Maximo Park and Anti-Flag. The festival makes every attempt to cover all styles and genres of music and the programme always includes pop, rock, electronic, metal, folk, jazz, blues, alternative, world music and even classical. The island is equipped with basic camping facilities and numerous pubs and restaurants, which make it a bustling 'festival city' of about 400,000 people for the duration of the event. Literary events, theatre, circus acts, dance of all genres and art exhibitions also add spice to the happening festival scene and there are even some interesting lectures and talks to attend if you need a break from all the live music. Check the official website for programmes and ticket information.